On this website you will find a wide range of football items, from the latest shirts and kits on your football club, to gifts, scarfs, training items and even retro tops on all the major club and international football sides on the globe. We have Premier League Shirts to Spanish La Liga kits, shirts from Eredivise and also German Bundesliga kits - it's all here. Have a look around, find your favourite club, and see what football shirts are available through our website. We supply data from a number of retailers so you can find the best online price for the shirt you want. 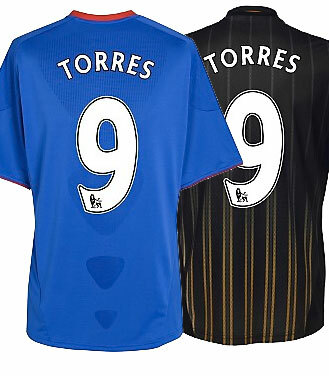 New Fernando Torres Chelsea shirts available to purchase, with name and number 9. This is the brand new England Home Shirt for 2009/11 – the new England football kit for the World Cup 2010. Russia unveil their brand new home and away football shirts and kit for the World Cup campaign 2010. Last chance to win a brand new football shirt. Juventus 2007/08 Tracksuit – nearly £30 off!